Los llevamos viendo desde que el frío empezó a acechar y esta última semana los hemos visto en desfiles de BCBG o Victoria Beckham así como en varios looks fuera de las pasarelas por las calles de New York. No hay duda que los”beanies” o gorros están siendo nuestros mejores aliados para combatir el frío y no dejar que nuestras ideas se congelen, y no es para menos, pues con la que ha caído en los últimos días (entre Nemo y las heladas por este lado del charco) el buscar prendas que nos caliente todas las partes del cuerpo ya ha pasado a ser una necesidad, pero eso si, siempre manteniendo el glamour! We have seen them since the cold started and this week we have seen them in BCBG or Victoria Beckham’s fashion shows and also in many street styles around New York city. No doubt that the “beanies” are being our best friends to fight cold and prevent our ideas to freeze, specially lately with Nemo storm and all the low temperatures in this side of the ocean, so we have had the necessity to look for garments that will warm up all our body parts, but of course… always with glam! Empiezo estos looks invernales con los gorros oscuros que son los más vistos en esta época y que combinan a la perfección con cualqueir tipo de outfit. I start these winter looks with dark beanies which are the most seen during this season and they look perfect with any type of outfit. Combinados con atuendos de colores queda genial! Dark beanies + color block = great! Otro color muy invernal es el gris, reconozco que en esta época suelo usar mucha ropa en este color. Another winter color is the grey. I recognize that during this season is one of my favorite colors too. Y estas tres opciones, aunque la del medio me recuerda un tanto al gorro de Bob Marley y la última tiene un look un tanto “apitufado”, no les parece? What do you think about these other options? The one from the middle reminds me a little bit of Bob Marley’s beanie and the last one give me kind of a “Smurf” feeling, don’t you think? Pero como lo mío es el colorido, aquí les dejo una selección capaz de alegrar cualquier look! Since I’m such a color lover, I leave you with these selection that can cheer up any look! Que les han parecido estos looks? Les va el look con gorro? Están en la onda “beanie style”? What do you think about these looks? 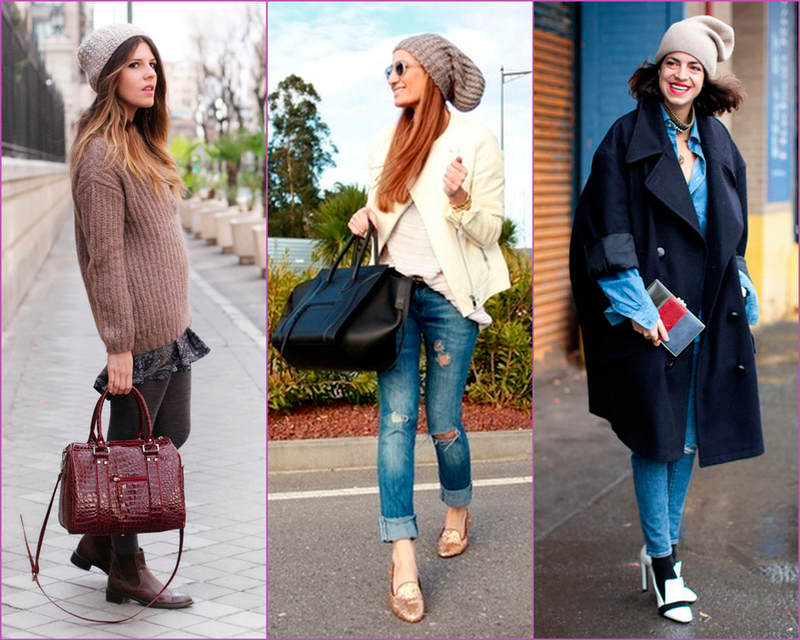 Are you into the beanie style trend? Do you like to wear them? Fotos/ Images: The Petticoat, Scent of Obsession, Lisa’s Place, Fashionvibe, The Fashion Guitar, Camille over the Rainbow, Le Blog de Betty, Late Afternoon, My Daily Style, Rebel Attitude, Mi Armario en Ruinas, Bartabacmode, Man Repeller, En tu Armario me colé, Zorannah’s Fashion Corner, Style Scrapbook, Tuula, Brooklyn Blonde, Harper’s Bazaar street styles.